The All-Star Classic Gymnastics Award is available with several different inserts. This Gymnastics Trophy is a great value for the size. It comes with a laser engraved brushed gold plate. FREE Shipping is available on orders over $100. FREE Engraving. This is a great choice for an economy gymnastics trophy. Choose a cheap gymnastics trophy for your team or tournament trophy event. The All-Star Gymnastics Award is available with several different inserts. This gymnastics trophy is a great value for the size. All custom built gymnastics trophies come with a laser engraved brushed gold plate. You will find a wide selection of gymnastics awards here. FREE Shipping is available on orders over $100. FREE Engraving. This is a great choice for an economy gymnastics trophy. Choose a cheap gymnastics trophy for your team or tournament trophy event. Looking for a very inexpensive basic gymnastics award or participation award? This Gymnastics figure on a white marble base is a great choice. The commemorative Gymnastics trophies come with a laser engraved brushed gold plate. You will find a large selection of gymnastics awards here. FREE Shipping is available on orders over $100. FREE Engraving. This is a great choice for an economy gymnastics trophy. Choose a cheap gymnastics trophy for your team or tournament trophy event. Looking for a very inexpensive basic gymnastics trophy or participation award? This Gymnastics figure on a white marble base is a great choice. The commemorative Gymnastics trophies come with a laser engraved brushed gold plate. You will find a large selection of gymnastics awards here. FREE Shipping is available on orders over $100. FREE Engraving. This is a great choice for an economy gymnastics trophy. Choose a cheap gymnastics trophy for your team or tournament trophy event. The Champion Classic Gymnastics Trophy is available with several different inserts. This gymnastics award has been a favorite for many years. All custom built gymnastics trophies come with a laser engraved brushed gold plate. You will find a wide selection of gymnastics awards here. FREE Shipping is available on orders over $100. FREE Engraving. This is a great choice for an economy gymnastics trophy. Choose a cheap gymnastics trophy for your team or tournament trophy event. The Champion Gymnastics Trophy is available with several different inserts. This gymnastics award has been a favorite for many years. All custom built gymnastics trophies come with a laser engraved brushed gold plate. You will find a wide selection of gymnastics awards here. FREE Shipping is available on orders over $100. FREE Engraving. This is a great choice for an economy gymnastics trophy. Choose a cheap gymnastics trophy for your team or tournament trophy event. The Classic Flaming Gymnastics Award is an inexpensive gymnastics trophy that children have enjoyed for many years. These gymnastics trophies are a great choice for any budget. Gymnastics awards come with a laser engraved brushed gold plate. FREE Shipping is available on orders over $100. FREE Engraving. 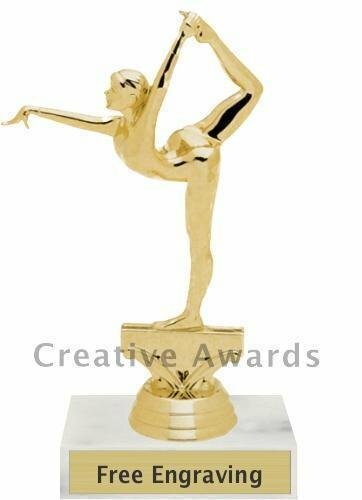 This is a great choice for an economy gymnastics trophy. Choose a cheap gymnastics trophy for your team or tournament trophy event. 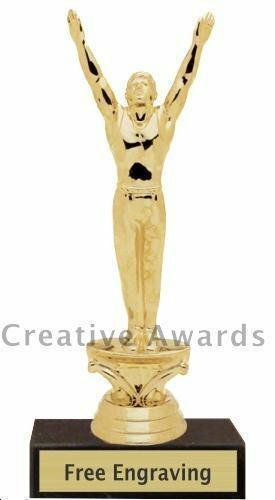 The Classic Gymnastics Trophy is an inexpensive gymnastics award that children have enjoyed for many years. These gymnastics trophies are a great choice for any budget. Gymnastics awards come with a laser engraved brushed gold plate. FREE Shipping is available on orders over $100. FREE Engraving. This is a great choice for an economy gymnastics trophy. Choose a cheap gymnastics trophy for your team or tournament trophy event. The Classic Nebula Gymnastics Trophy is an inexpensive gymnastics award that children have enjoyed for many years. These gymnastics trophies are a great choice for any budget. Gymnastics awards come with a laser engraved brushed gold plate. FREE Shipping is available on orders over $100. FREE Engraving. This is a great choice for an economy gymnastics trophy. Choose a cheap gymnastics trophy for your team or tournament trophy event. The Classic Star Gymnastics Award is an inexpensive gymnastics trophy that children have enjoyed for many years. These gymnastics trophies are a great choice for any budget. Gymnastics awards come with a laser engraved brushed gold plate. FREE Shipping is available on orders over $100. FREE Engraving. This is a great choice for an economy gymnastics trophy. Choose a cheap gymnastics trophy for your team or tournament trophy event.